Can a Christian lose his salvation. According to Saint Paul, the answer is “yes”. Most Evangelical Christians hold that a Christian is “once saved always saved,” by which they mean that once a person has committed his life to Christ, he can never do anything to undo this gift of salvation. The explanation assumes that since the gift of salvation was freely granted, there is nothing that one can do lose it. Contrary to this, we know that gifts can be abandoned, rejected, or destroyed by of the ill will of the recipient. A father may purchase a sports car and freely give it to his son as a gift. It is rightly assumed that a gift cannot be “ungifted” or taken away. I am sure that the son would receive the car gleefully. However, the son may turn around and sell the car for drugs, crash the car, or neglect the car so that it no longer functions. The gift was not “ungifted”. Rather, the worth of the gift was rejected through negligence. This difference demonstrates that for Saint Paul and the Catholic Church, salvation is understood as progressive and multidimensional. When Evangelicals read Paul, they observe a stress on “faith” and so they focus on this aspect of Paul’s teaching. 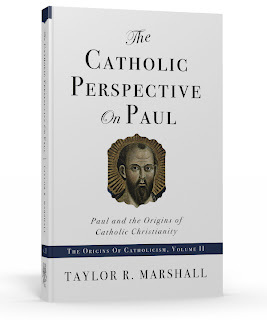 The Catholic Church reads Paul and discovers in his writings a stress on faith but in the context of various over doctrines: baptism, the church, good works, tradition, liturgy, sanctification, etc. To use an illustration, it is as if two different people look at a written piece of music. The first looks at the piece and after studying concludes, “The note “D” seems to be predominate.” Then he walks over to the piano and strikes a “D” on the piano. The other person studies the same sheet of music and concludes, “This piece of music is in the key of D.” He then walks over to the piano and plays the beautiful piece of music from the sheet in the key of D. The first person tried to distill the music down to one note and as a result, he neglected the rest. However, the second person realized that “D” was the overarching theme and yet he incorporated all the other notes so that something more beautiful resulted.